clear. Medium range, somewhat clean mix. Soft, balanced feel. Sizzling ping over a full wash.
Paiste PST 3 cymbals are affordable cymbals with never-before-possible sound quality and pro-level looks. 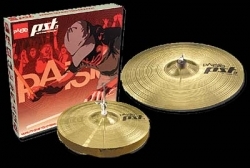 PST 3 cymbals are made from a selected and especially sonorous brass copper-based alloy.